ECB To End QE In December, Will Keep Rates Unchanged "As Long As Necessary"
In a statement that was a virtual replica from September, the ECB announced it was keeping its three key rates unchanged (main refinancing operations: 0.00%, marginal lending facility: 0.25%; deposit facility: -0.40%), that it will end its LSAP QE program at the end of December however "subject to incoming data confirming the medium-term inflation outlook", that it will reinvest the principal payments from maturing securities purchased "for an extended period of time" and that in keeping with its prior forward guidance, "rates will remain at their present levels at least through the summer of 2019, and in any case for as long as necessary to ensure the continued sustained convergence of inflation to levels that are below, but close to, 2% over the medium term." 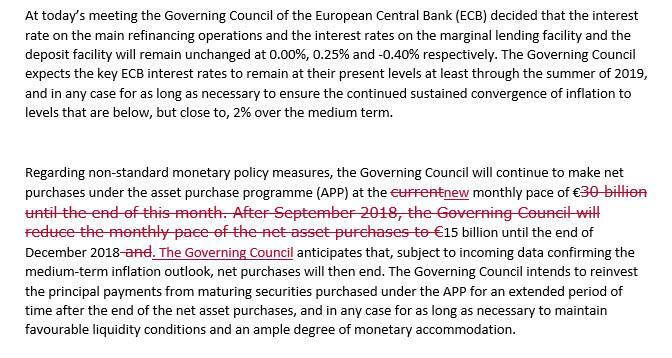 In short, no surprises, even though as Bloomberg notes, the ECB still says it "anticipates" to end new QE purchases in December, while some analysts had suggested the Governing Council might tweak the language to make the commitment stronger. Not yet. Here is the redline comparison with the September statement showing the lack of changes. And now we look forward to Draghi's press conference in just over half an hour's time.